Mexican Hot Chocolate and a Giveaway! Baby, it’s COLD outside. Dammit. I was really hoping that the slightly warm-ish weather was gonna stick around. Until May, when it would really warm up. But it’s not to be. Instead, it’s time to hunker down with pots of hot chocolate spiked with peppermint schnapps, catch up on our DVR and Netflix queues and reflect on the good ol’ times when our skin wasn’t so pasty. However, in spite of pastiness, I am feeling very festive this year. So festive, in fact, that I have arranged for another giveaway! Yet something else I brought back from Italy (don’t worry, it was vacuum sealed, so it’s in A-OK condition): Hot Chocolate or as the bag tells me in Italian: Cacao Amaro in Polvere. Fancy, right? This particular chocolate powder is sugar free, which I think is the way to go because you can add your own amount of sugar to taste. Basically, you heat up some milk (or water – it seems that you can use either according to the directions and my limited knowledge of Italian), mix in some chocolate powder, some sugar (I actually like to use confectioners sugar) and PRESTO! you have hot chocolate. Really good hot chocolate too. 1. How do you win this hot chocolate powder? 2. How do you make hot chocolate BETTER, even if you don’t win the prize? I will answer both questions, in order. 1. To win the hot chocolate, you must leave a comment on this blog. From NOW until next Friday at midnight. That’s all. 2. 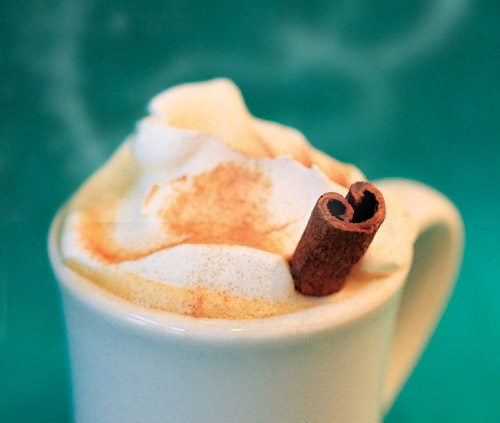 To make the hot chocolate BETTER, even if you don’t win the prize, I have provided the following recipe for Mexican Hot Chocolate Made with Italian Chocolate Powder and Spiked with Dr. McGillicuddy’s Peppermint Schnapps. I have just combined a lot of nationalities for this recipe. 3 ounces (tablet or cone) Mexican chocolate or bittersweet chocolate, OR the Prize Chocolate. And honestly, I say put in as much as you like, you’re drinking it after all. 2 tablespoons sugar – really go slowly on this. Pinch of chile pepper – for KICK! If using the block chocolate, get a sharp knife and break up the chocolate into smaller pieces. In a saucepan, combine the chopped chocolate, milk, sugar, salt and chile pepper over medium-low flame. Heat and stir until the chocolate is completely melted and milk is very hot, but not boiling, about 10 minutes. Remove from the heat and froth the chocolate milk with a mini whisk or molinillo. Divide the hot chocolate among big mugs (those ones with giant snowmen on them are fun) and serve with the cinnamon sticks. Optional: Throw a shot (more or less) of Peppermint Schnapps into each mug. Now hunker down with those X-Files DVDs and have yourself a winter! But first drop a comment on this blog so you can win yourself some chocolately swag! • Recipe thanks in part to Tyler Florence. I modified it a tiny bit.